Beautiful string of multicolored beads of myriad shapes. Such type of strings were a lot in fashion in our part of the country,perhaps a decade back. Looks like the interest is rolling back. Ironically, i threaded a string of beads of many necklaces of artificial jewellery,i used to wear in younger days to match with every dress. I hardly wear any piece now. In a creative spree i did the job a few months back. I'm not yet sufficiently strong after the long drawn infection Hope everything is going on well with you. That is a beautiful ornament. Your grandmother is very talented to repair it so nicely. And, Bravo to your Grandmother for mending it herself! 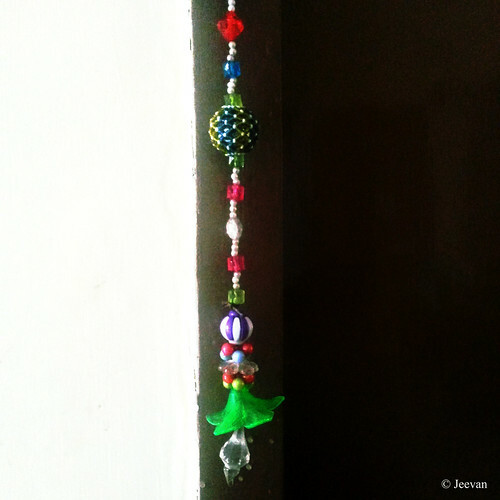 I bought some ornaments from Kaadhi Kraft and similar places in Bangalore - yet to be re-hung in the new home. Great share, Jeeven and I love the way you have blackened out the background. A lovely string of colourful beads. The way you photographed it with contrasts looked Avant Garde. Nice - and even better than your Grandmother fixed it. Very nice wall hanging... Our mothers and grandmothers are the most patient and creative heads we know, I guess! Beautiful subject chosen by you for clicking.